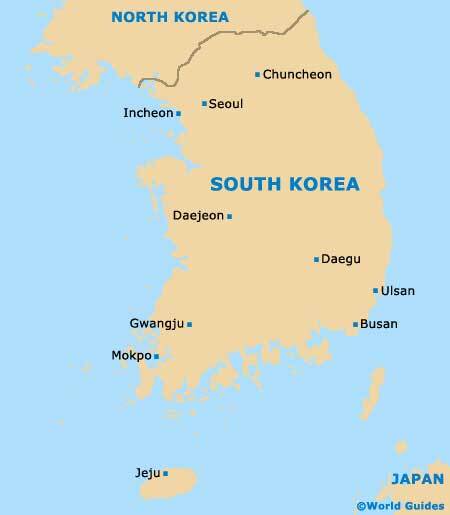 Previously known as the Republic of Korea, the country of South Korea resides within East Asia and encompasses the southerly region of the Korean Peninsula, where it lies between the Sea of Japan and the Yellow Sea. South Korea is edged by North Korea, while to the south-east and across the Korea straight, Japan is particularly close. Now amongst the wealthiest and most important countries in the whole of Asia and the world, South Korea is actually rather historic and home to one of the oldest ongoing civilizations in existence, dating back more than 4,300 years. Seoul is the capital and this dynamic and exciting city is a successful fusion of past and present, with many ancient temples and modern skyscrapers, particularly around Yeoui-do and the Han River. Busan is another important South Korean city and second only in size to Seoul, being known for its busy port. The ancient attractions of Daegu and Gyeongju serve as something of a tourist attraction, along with the beautiful beaches of Jeju Island. Also worth a visit in South Koea is Chuncheon, Daejeon, Jeonju, Guinsa, Panmunjeom, the Seonyu Island and the sprawling Seoraksan National Park. An exciting city and full of energy, Seoul is the capital of South Korea and is where the Olympic Games of 1988 were hosted. Seoul is a particularly affluent city and is overflowing with grand temples, extravagant palaces and historical gateways.